Just the name, the black forest actually is a forest in the south of Germany. That’s the region where this cake originates from. The cherries, oh the sweet cherries. I know you can find cherries elsewhere, but somehow I feel Germans are obsessed with cherries. Why go for raspberries if you have delicious cherries? Chocolate and raspberries is great, but chocolate with cherries is – German. I do recommend either using frozen or fresh ones. Not canned. Please go for the real deal. Because you need many cherries for the filling. Cherries and chocolate rock! The chocolate sponge cake. Sponge cake is so very German. Like the vanilla version is often used for a roll, I did one version in this strawberry roll. The chocolate one is most common in Black Forest. Simple as that. Because we like things chocolate. 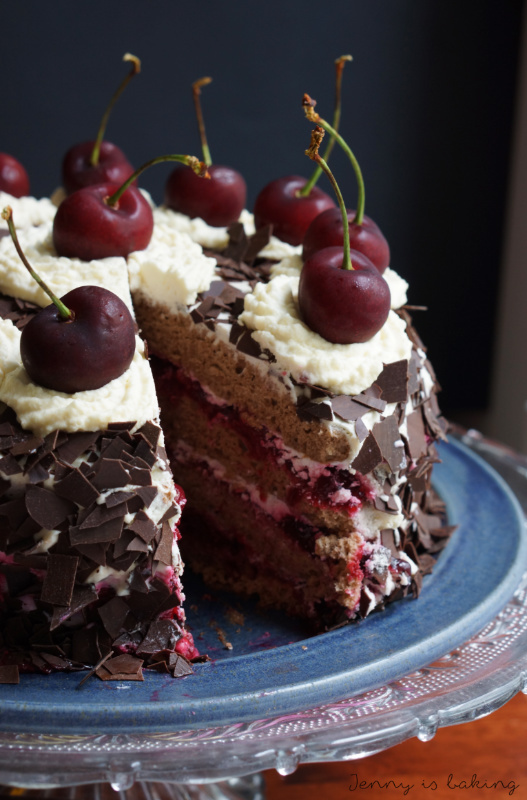 Real Black Forrest Cake will always have Kirsch/cherry liqueur. Depending who you ask, this can be anything from a small amount added to the cherries or the sponge cakes pratically drenshed in kirsch liqueur before assembling. Lots and lots of whipping cream. That is very German. We like whipping cream. We like to eat any cake with a little dash of whipping cream on the side. No buttercream. Cream cheese is too fussy, no, go straight for delicious whipping cream. Whereas Americans may go for ice cream instead, we are happy with whipping cream. Homemade of course. Chocolate shavings. Another thing hard to come by if you don’t live somewhere in Europe. But a must on this cake. Sprinkled generously all around. 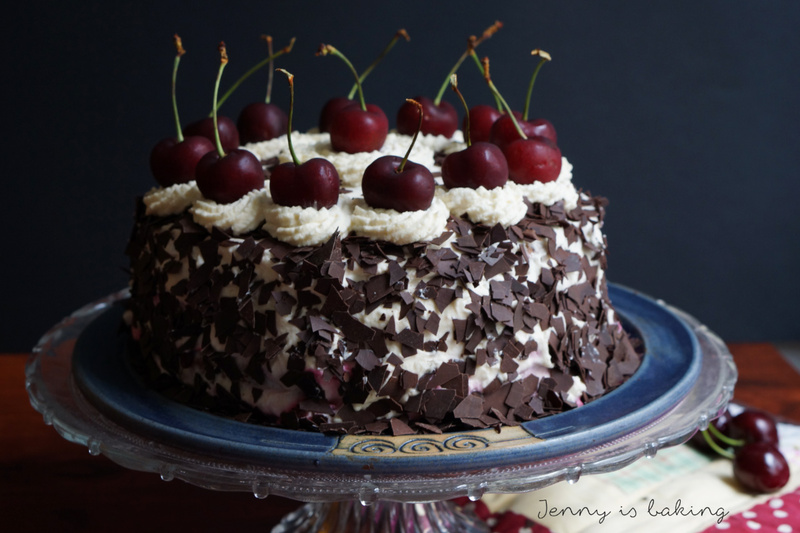 So when a Colombian friend requested for me to bake a Black Forest Cake, I looked for a long time. Because I am picky with the cake of all cakes. I want my cake to taste more than whipping cream. I want the sponge cake to be light and fully, yet I don’t want to beat the eggs for 15 minutes since I don’t have a machine except for a hand mixer. And I want lots and lots of cherry flavor. And that’s why I made a mix of recipes. The sponge cake is very similar to the vanilla one I used in the strawberry roll. The cherry filling I got from the American blogger Sonia who really makes the cherries a dominant part of the cake. 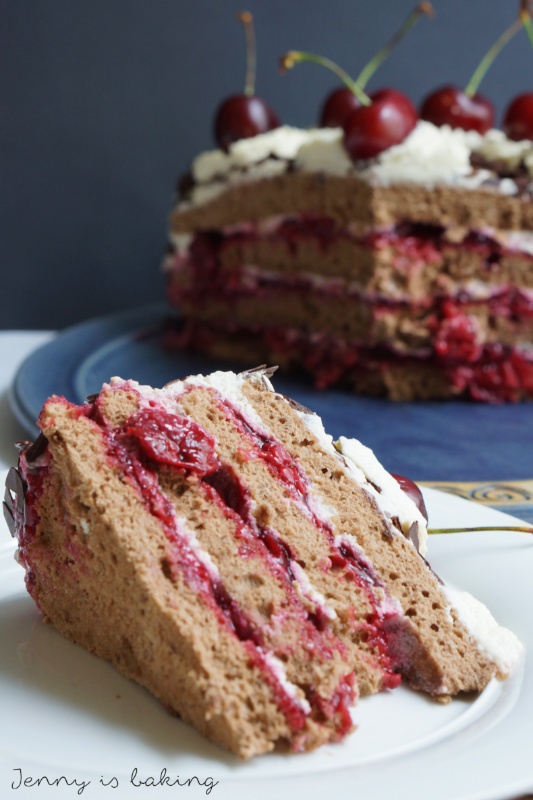 So let’s have a look at this cakes of all cakes: Traditional Black Forest Cake. For the chocolate sponge cake first preheat the oven to 180 degrees Celsius. Only put parchment paper on the bottom of your springform, but don't butter it. Then beat the egg yolks with the 100 grams of sugar and vanilla for a few minutes in a large bowl until much lighter in color and thicker. Clean your mixer and a smaller bowl thoroughly before you beat the egg whites until soft peak forms on medium speed. This takes a few minutes. Now add 60 grams of sugar and beat on high speed until the sugar has dissolved. To check, rub a little bit between your fingers and see whether you can feel the sugar, if you don't, you can stop. Sift the flour, cornstarch and cocoa (don't skip this) on the egg-yolk mix and put the egg whites on top. Gently mix with a spatula or wooden spoon. Do not overmix. Just make sure you get an evenly brown mix and you don't see any more cocoa/flour pockets. Either pour the batter in one large springform or four smaller ones. Depending on how high your springform is, baking time varies. I only baked mine for 10 minutes as I have very small 20 cm pans, in a regular 26 cm springform baking time will be around 25 minutes. Do not open the oven door during the first 20 minutes to be sure your cake rises properly. Take out and cool off before cutting into three layers. The sponge cake can be prepared the night before. Cover in plastic wrap in the fridge if used the next day. For the cherry filling put cherries, sugar and liqueur in a pot on the stove. Bring to boil, reduce the heat and let simmer for five minutes. Meanwhile prepare the tapioca starch with the water and lemon juice. Stir in a mug until you see no lumps. Add to the cherries and let thicken for a minute. Add the butter at the end and let melt. Set aside. To assemble the cake, first whip up the whipping cream with the vanilla extract and sugar. Then brush some kirsch liqueur on the bottom layer. Put one third of the cherry filling on top, then some whippig cream. Leave the edges empty. Continue with all layers except the top one. Once done, put whipping cream all around the cake, filling also the holes between layers. It doesn't have to look perfect as you will put chocolate shavings around. Keep some whipping cream for the top decoration. Put chocolate shavings all around the cake. I find it easiest to take a bit in my hand and then "pat" it on the cake. It is a bit messy. 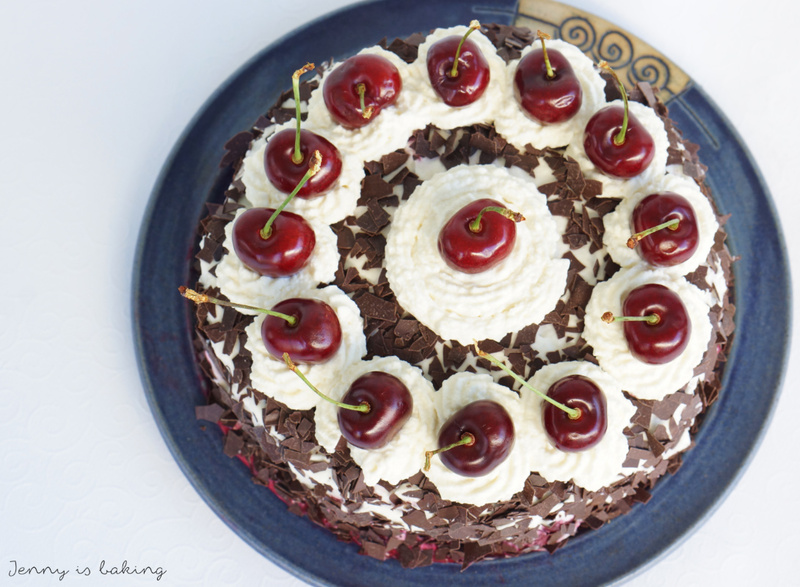 Pipe circles of whipping cream on the top and decorate with fresh cherries. Enjoy! 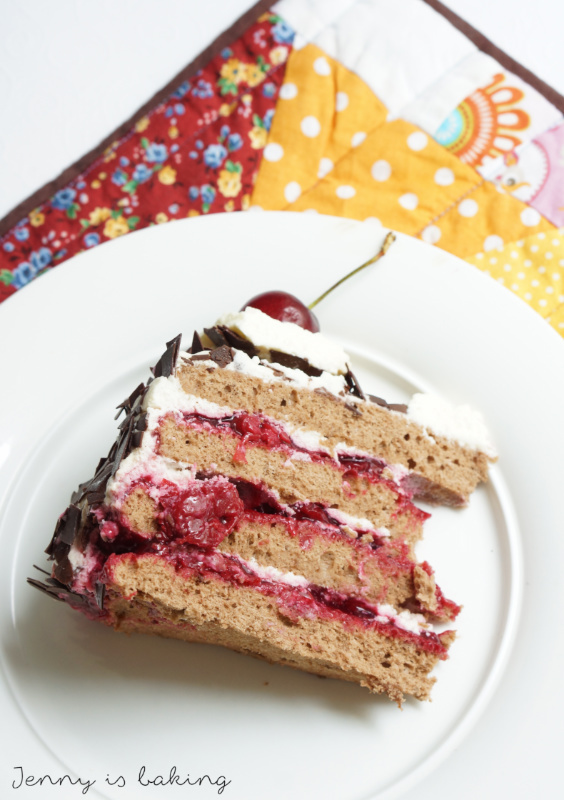 Black Forest Cake may require some work, but you can prepare everything in advance. As stated the sponge cake can be frozen, you can also make the cherry filling and even the whipping cream one or two days in advance. It also freezes beautifully as a whole and will taste even better on day 2 if kept in the fridge overnight. Just make sure you always put it in the fridge for the whipping cream to keep. So which other traditional cakes do you like?